Consider these options and strategies to pump up your Social Security benefits — Center for Financial Planning, Inc.
As a frequent speaker on Social Security, I’ve had the pleasure of educating hundreds of retirees on the nuances and complexities of this confusing topic. Over the years, I’ve come to realize that, unfortunately, many of us do not take the decision about when to file as seriously as we should. In 2018, the average annual Social Security benefit was roughly $17,000. Assuming a retiree lives for 20 years after receiving that first benefit check, you’re looking at a total of $340,000 in lifetime benefits – and that’s not accounting for inflation adjustments along the way! We work to help our clients receive nearly double that amount each year – $33,500 – which is close to the maximum full retirement age (FRA) benefit one can receive. Assuming the same 20-year period means nearly $700,000 in total lifetime benefits. It’s not unreasonable for a couple with earnings near the top of the Social Security wage base to see a combined, total lifetime benefit amount north of $1,500,000 as long as you are award of the decision process. As you can see, the filing decision will be among the largest financial decisions – if not THE largest – you will ever make! Seventy-five percent of Americans will take benefits prior to their full retirement age (link #1 below) and only 1 percent will delay benefits until age 70, when they are fully maximized. In many cases, financial and health circumstances force retirees to draw benefits sooner rather than later. But for many others, retirement income options and creative strategies are oftentimes overlooked, or even taken for granted. In my opinion, longevity risk (aka – living a really long time in retirement) is one of the three biggest risks we face in our golden years. Research has proven, time in and time out, that maximizing Social Security benefits is among the best ways to help protect yourself against this risk, from a retirement income standpoint. 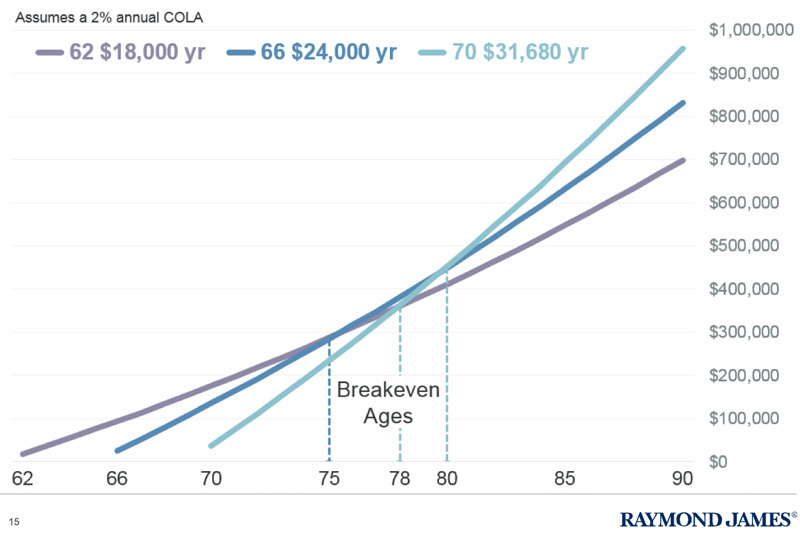 Each year you delay, you will see a permanent benefit increase of roughly 8 percent (up until age 70). How many investments offer this type of guaranteed income? Let’s look at the chart below to highlight this point. You can see a significant difference between taking benefits at age 62 and at age 70 – nearly $250,000 in additional income generated by delaying! Keep in mind, this applies for just one person. Married couples who both had a strong earnings history or can take advantage of the spousal benefit filing options receive even more benefits. I’ll never forget a conversation I had with a gentleman named Mark after one of my recent educational sessions on Social Security. As we chatted, he made a comment along the lines of, “I have just close to $1.5 million saved for retirement, I just don’t think Social Security really matters in my situation.” I asked several probing questions to better understand his earnings record and what his benefit would be at full retirement age. We were able to determine that at age 66, his benefit would be nearly $33,000. Mark was 65, in good health, and mentioned several times that his parents lived into their early 90s. Longevity statistics suggest that an average 65-year-old male has a 25 percent chance of living until 93. However, based on Mark’s health and family history, he has a much higher probability of living into his early to mid-90s! If Mark turned his benefits on at age 66, and he lived until age 93, he would receive $891,000 in lifetime benefits. If he waited until age 70 and increased his annual benefit by 32 percent ($43,500/yr. ), his lifetime benefits would be $1,000,500 (keep in mind, we haven’t even factored inflation adjustments into the lifetime benefit figures). I then asked, “Mark, if you had an IRA with a balance of $891,000 or even $1,000,000, could we both agree that this account would make a difference in your retirement?” Mark looked at me, smiled, and nodded. He instantly understood my point. Looking at the total dollars Social Security would pay out resonated deeply with him. All too often, we don’t fully appreciate how powerful a fixed income source can be in retirement. It’s astounding to see the lifetime payout provided by Social Security. Regardless of your financial circumstance, it will always make sense to review your options with someone who understands the nuances of Social Security and is well educated on the creative ways to draw benefits. Don’t take this decision lightly, too many dollars are at stake! Feel free to reach out to us if you’d like to talk through your plan for Social Security and how it will fit into your overall retirement income strategy. Nick Defenthaler, CFP® is a CERTIFIED FINANCIAL PLANNER™ professional at Center for Financial Planning, Inc.® He contributed to a PBS documentary on the importance of saving for retirement and has been a trusted source for national media outlets, including CNBC, MSN Money, Financial Planning Magazine, and OnWallStreet.com. Sources: 1)	https://www.ssa.gov/planners/retire/retirechart.html 2)	https://money.usnews.com/money/retirement/social-security/articles/2018-08-20/how-much-you-will-get-from-social-security The information herein has been obtained from sources considered to be reliable, but we do not guarantee that the foregoing material is accurate or complete. This information is not a complete summary or statement of all available data necessary for making a decision and does not constitute a recommendation. You should discuss any tax or legal matters with the appropriate professional. Older PostWhat happens to my Social Security benefit if I retire early?